Retail chains worldwide are installing StopLift Checkout Vision Systems' Scan-It-All video recognition technology to detect scan avoidance incidents at both the manned and self-checkout. From retailers on four continents, including Tesco in the UK, StopLift has already detected and confirmed more than 1.7 million incidents at thousands of checkouts. 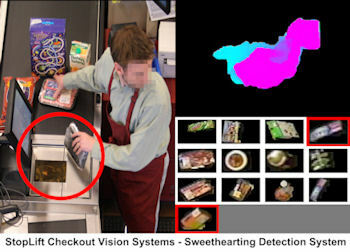 These incidents include "sweethearting", when cashiers pretend to scan merchandise but deliberately bypass the scanner, thus not charging the customer for the merchandise. The customer is often a friend, family member or fellow employee working in tandem with the cashier. 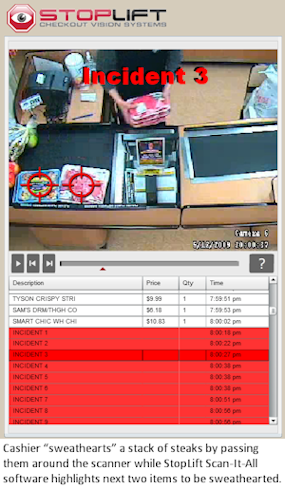 StopLift's patented Scan-It-All video analytics technology visually determines what occurs during each transaction to immediately distinguish between legitimate and fraudulent behavior at the checkout. As soon as a scan avoidance incident occurs, StopLift, which constantly monitors 100% of the security video, flags the transaction as suspicious. It quickly reports the incident, identifying the cashier or customer and the date and time of the theft. This includes incidents which may be due to mistakes by the cashier or customer at self-checkout as well as items left in the shopping cart. Dishonest associates are identified on the basis of video evidence the first time they conduct a fraudulent transaction, rather than months or even years down the road, significantly reducing inventory shrinkage, deterring future theft, and boosting profitability. Customers are identified at the self-checkout. Retailers have tried to track sweethearting or scan avoidance through data mining, but, as Kundu notes: "How do you do data mining when there's no data?" The U.S. National Retail Federation states that retail shrink was $44 billion in 2014 and about $14 billion of that is due to sweethearting. Supermarkets, with their average 1-2% profit margins, are particularly vulnerable to sweethearting, which has accounted for an almost 35% profit loss industrywide. StopLift Checkout Vision Systems grew out of Kundu's Harvard Business School research study "Project StopLift" on Retail Loss Prevention. With technological research insights Kundu developed while at MIT, Project StopLift concluded that video recognition could be used to automate and, thus, make possible the comprehensive examination of surveillance video. Prior to founding StopLift, Kundu developed facial recognition systems for identifying terrorists in airports.